The cool bad guy, the cute little guy, the normal guy, and the weird creepy guy. I would like to join them for a nice game of Monopoly. 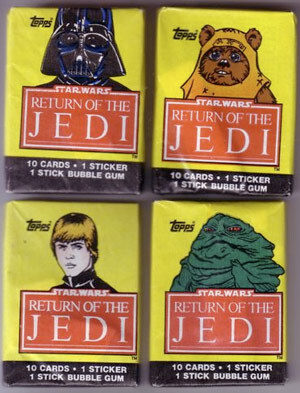 Those are also the figures on the wax packs of the Topps Return of the Jedi trading cards (1983). Play against Jabba the Hutt in monopoly? You know he would cheat. Do you know that a Google search for “Monopoly pieces” results in your photo from a 2004 blog regarding a “faceoff” but “originates” from a thread on Narutofan.com? LOL! Actually the individual Monopoly piece photos originate somewhere else so I don’t have a big beef with it. They were individual images from what I recall. I merged them together into one image. I also made them rectangles instead of squares, cleaned up the black borders and made the cannon break the black border. I see from Google Images that this image has been taken from my blog and used in various other places on the web.